Older people planning their retirement have cause for concern. Forty-two percent of Americans are facing their golden years with less than $10,000 in savings. Out-of-pocket expenses for health care are spiraling. Americans 65 and older may spend up to $46,000 annually on healthcare. This is not good news for those with only $10,000 to fall back on. Those over 50 should act now, while there is still time. Only 1/3rd of adults in that age group have savings greater than $10,000. Pensions are becoming rarer, and Social Security is less secure than it used to be. The health needs of seniors are not covered by Medicare. Some experts believe the Social Security system will be depleted by 2030. Adults over 50 need to consider contributing to 401(k) accounts or similar plans. Social Security was never intended to be the sole income of retiring seniors. It was meant to supplement approximately 40% of post-retirement spending. It was supposed to enhance seniors’ lives, not support them. However, 43% of unmarried seniors rely on Social Security to cover 90% of their basic needs. Almost ¼ of married couples depend on Social Security to meet most of their expenses. Some seniors struggling with poverty are able to receive supplemental income, such as food stamps. The need is especially high for women, African Americans, Hispanics, and those with ongoing health issues. 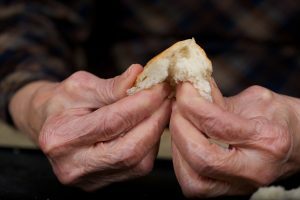 6,400,000 million American seniors are living at poverty level, and struggling to meet basic needs like rent and food. This number is likely to increase as more boomers become eligible for Social Security, and the system becomes less able to support them. The current Social Security system will be unsustainable at some point, and Millennials are aware that changes are coming. They know that benefits will likely be reduced by the time they grow older. Economic Recovery — But for Whom?